Sunday was a miserable day. It was the first weekend in May, a time when many nearby communities were celebrating the unofficial arrival of spring. 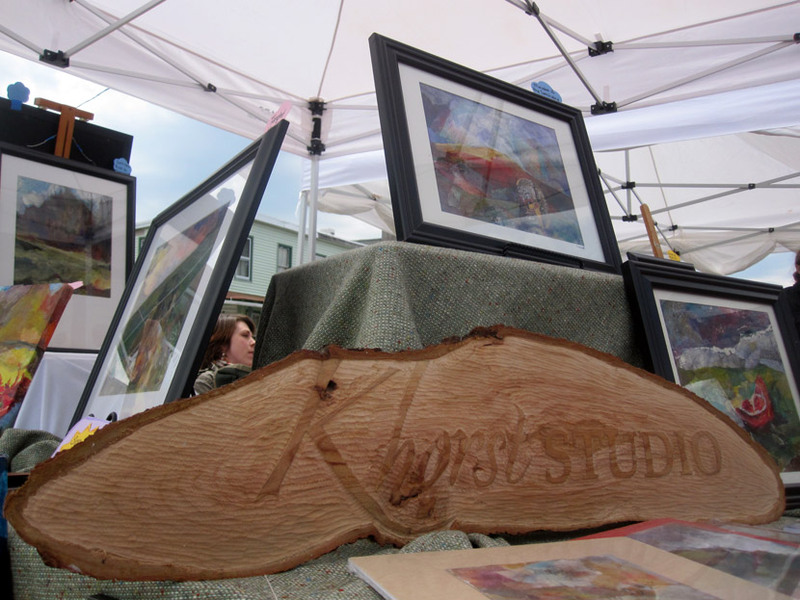 Lancaster city was hosting its annual ArtWalk. Small cities were having community events. Plus there were some rather exciting things happening at our church. But my wife and I had committed to setting up a booth full of her collages for our hometown’s “Artist Alley” show. And despite the weatherman’s assurance of sun, after the last item was loaded into the back of my truck, the rain started falling. I had regretted our decision before this point, worried that very few people would show up, but now I was confident that would be the case. The rain wasn’t overly heavy and we were able to set up our booth thanks to a brand new tent our neighbors graciously let us borrow. As we prepared, one man showed up early and expressed great interest in one of Kate’s collages. But he walked away with only a business card and was one of a very few number of people that visited our booth all day. My wife’s collage display at Artist Alley. Halfway through the event the rain let up and the sun came out. Yes! But wind quickly replaced the rain and that proved challenging for our setup. Every now and then we had to pick up pieces that blew over, which was not a big deal—until the big gust. We heard a loud whoosh of wind and before we knew it, despite having anchor weights on the legs, our tent was suddenly resting atop our neighbor’s tent. With the help of other artists, we pulled it back down. It was during that process one of the supports snapped in two and we realized our day’s investment had fallen firmly into the red. We would now be buying a formerly-pristine E-Z Up from our neighbor. Even on the best of days I have this lingering question in the back of my head: is art worth it? But by Sunday evening the question was resounding loudly between my ears. I’m not just referring to fruitless community shows. Early last week Kate and I went to an exhibit and gallery talk by Makoto Fujimura and Bruce Herman. I’ll probably write more about it later as it was an inspiring experience. The works were amazing and the talk was enlightening, but still I had to question the value. What good is this artwork doing anybody? And the endless talk about art…does it do anybody any good? As we packed up our broken tent and hauled our broken spirits home, I had a realization. I love art. It’s something I do when I have the time and something I wish I was doing when I don’t. Even after a brutal day of disappointment, I value art no less. It’s our desire for income and respect that causes our inner turmoil. We get so wrapped up in assigning value based on monetary return and social impact that we forget about the true joy it creates in our own lives. And here’s the thing: I’m not that unique. I know of at least eight other artists in my hometown who were also willing to put a lot of time into displaying their artwork, knowing full well that very few eyes would see it. There are millions of people just like us—people who enjoy the challenge and the process of creating, people who save their money to purchase artwork that excites them, and people who can savor the moment of standing in front of Fujimura’s QU4RTETS III and bask in its beauty. And there is value in beauty. There is value in speaking into culture and in exercising the gifts God has given. There is so much that can be said in defense of art. But when, in my heart, I question the value of art, the most compelling response I can give myself is that my world would be much emptier without it.